A price crash, yes. But a surprise? No. Ever since hog futures hit record high levels in 2014, this day has been coming. It’s inevitable that when the supply of a certain commodity tightens and prices rise, it will be followed by a period of rising production and declining prices. And that’s exactly what we’re seeing now. As most hog producers will remember, between early 2006 and 2009 the pork industry was awash in red ink, battered by weak market prices and the sharply higher feed costs that accompanied skyrocketing corn and soybean prices. In the wake of those difficult times, Canada lost an estimated 28% of its hog farms and 20% of its hog inventory. The situation was much the same south of the border, with American producers similarly slashing hog production in response to the dire market conditions. With fewer pigs headed to market, prices of course eventually began to rise – as the law of supply and demand dictates. The end result was the massive bull market in hogs that culminated in the summer of 2014, as seen on the chart here. 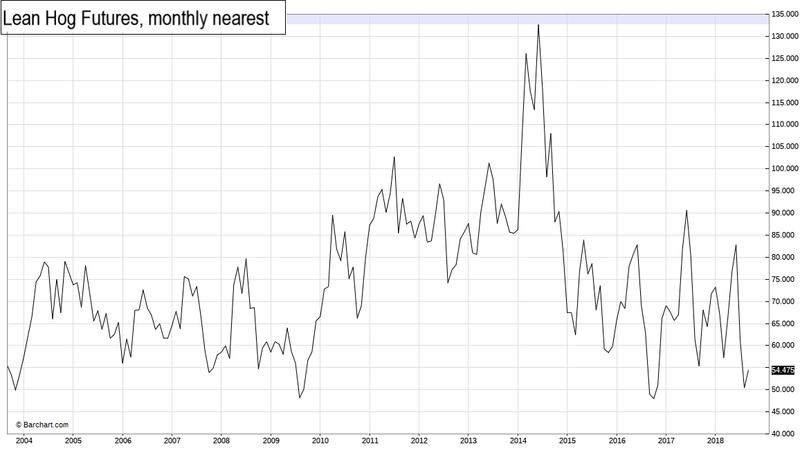 Meanwhile, as hog prices were beginning their ascent, feed costs began to fall as corn and soybean producers stepped up production in response to the earlier stronger prices that they were seeing. With hog profits on the rise, producers, predictably, entered a period of herd expansion. Here in Canada, producers have been more reluctant to jump on the expansion bandwagon. But by June 1, 2018 the number of hogs and pigs in the price-leading US market hit 73.5 million, the highest June 1 inventory of all hogs and pigs since estimates began in 1964. In simple terms, US hog farmers have overproduced to the point now where the market is telling them to stop by way of lower prices. Losses per head are reportedly ranging anywhere from US$25 to $40. Certainly, those kinds of losses sting and are likely enough to convince most producers on both sides of the border to pull back. But at the same time, the red ink is hardly surprising – just as the eventual pendulum swing back to better times won’t be surprising either. Need help navigating the cyclic ups and downs of the livestock markets? Try out our daily Ag-Alert newsletter.